Specialty dinners, such as dinner theater, fundraisers or a wine tasting are great way to get extra business into your restaurant during slower seasons. These types of dinners work well for both large and small groups and are ideal for those slow weekends in between the busy seasons. Wine tastings are especially popular, because people love good wine and good food, especially when they come together. What Is a Wine Tasting? A wine tasting is just that. Guests enjoy sampling various wines, usually from a particular region and converse with a sommelier (a wine expert) about the wine- how it is made, the difference between the various wines and how to select a wine for home. A sommelier can explain the subtle differences between each wine, and answer questions guests might have about the wines. Along with wine, a specialty menu is served, which is designed to complement the wine. You can serve an informal buffet of appetizers and finger food or a full sit down dinner. For example, if the evening's theme is wine from Italy, you could serve authentic Italian dishes, such as fresh tomato bruschetta and tiramisu. See a sample wine tasting dinner menu. Why Should I Host a Wine Tasting? A great non-seasonal promotion. In Maine (my neck of the woods), March is the month of Restaurant Doldrums. Too late for skiers, to early for summer people. We host a wine tasting to lure people out in the bitter winter weather, with the promise of good food and drink. A wine tasting is also a chance to showcase new foods and bring in new customers. First check with your local liquor laws to see if there are any specific rules around a wine tasting. Unless your state has some odd law about serving wine (and some states do) a wine tasting is usually covered by your regular liquor license. Next, you will need to reserve a sommelier. A sommelier is just a fancy name for someone who knows a lot about wine. The wine sales rep for your restaurant should be able to put you in contact with a sommelier or act as the sommelier himself. If the salesperson does it, it is usually a free service because you are purchasing wine from them. You then need to settle on a wine list and menu, make up promotional flyers and advertisements and print tickets. But Won’t All My Customers Get Drunk? Not if you host your wine tasting properly. While there are always a few people who will throw back goblet after goblet of wine like it's going out style, most people who attend a wine tasting have a genuine interest in experiencing new wines and learning about the wine process. However, a wine tasting doesn’t mean your staff should ignore their TIPS training. Anyone who is exhibiting any signs of drunkenness should not be served any more alcohol. Also, remember that you are not serving a full glass of each wine on the menu. You are giving customers a taste (hence the name) of each wine. The amount of wine served should equal 3 regular glasses of wine, or half a bottle of wine. If anyone complains about you skimping on the wine, remind them that there are many more sample tastes to follow. A wine tasting is a great way to bring extra business during a typically slow period. 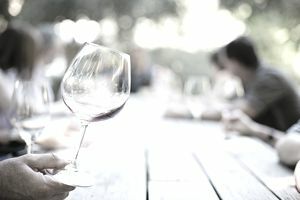 With proper marketing and staff education, a restaurant wine tasting is an excellent way to increase your reputation as a quality restaurant. Wine tastings are an easy event to plan and promote, though attention should be paid that customers are not given too much wine. Proper staff training around responsible beverage service can help prevent any problems and ensure that everyone has an enjoyable evening.